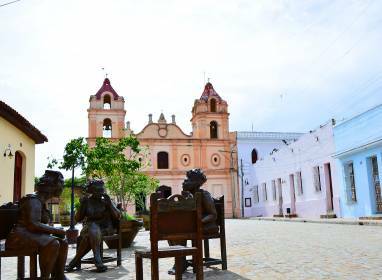 Camagüey first tempts you by revealing the city’s secrets. With one of the largest and most unusual old towns in the country, we suggest you tour some of the emblematic sites in this World Cultural Heritage city, so you can learn the local history and customs first hand. A real symbol of the city, Martha Jiménez has managed to expertly portray the traditions and legends of historic Camagüey. Entering her studio is like venturing into a magical world where materials and tools dialogue with the region’s stories and legends. Next to the popular square called Plaza del Carmen, you can chat to the artist and see close up how she weaves some of the most prized dreams of this city’s residents into her clay and bronze. Its prime location at the very heart of traditional Camagüey makes the Gran Hotel an ideal spot for taking in the city. 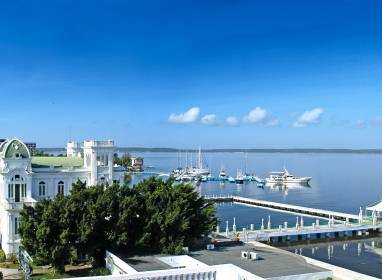 From its terrace, while listening to a range of attractive music options and sipping Cuban cocktails, you can admire the singular beauty of the city as the sun sets in the east of the island. A truly special moment to share with your partner, family or friends. The heartbeat of the old town, this beautiful square is a popular meeting place for both locals and visitors. On one side of the Church of La Soledad, you can take different routes through the popular streets such as Calle República, the boulevard or Calle de los Cines. Popularly known as the Plaza de La Merced Square, it is one of the most visited spots in the city. Next to the square stands the emblematic Church of Merced (Our Lady of Mercy), one of the oldest in the city built in 1748. The silver lamps, the throne of Our Lady of Sorrows and the Holy Sepulchre are just some of the treasures found here. The construction of the Holy Sepulchre is one of the best-known legends of the city. Under the high altar, in part of its ancient crypts, there is a museum with relics gathered from all over the province. On one side of the nave they keep artefacts Pope John Paul II used when he gave mass in Camagüey in January 1998. It is in the square called Plaza de los Trabajadores, in the city’s historic centre. This building brings together the best of the city’s eclecticism and it is surrounded by a great variety of architectural styles. Major General Ignacio Agramonte y Loynaz, the leader of the independence movement against the Spanish colonial power in Camagüey, was born in the second room on the second floor on 23 December 1841. The building, owned by his paternal grandparents, dates from the first half of the 18th century. 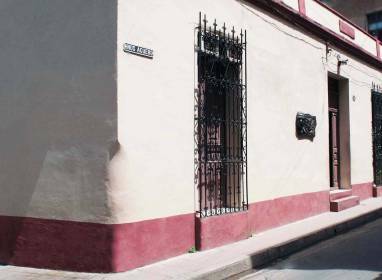 It is a typical residential property of the colonial age with two floors and a mezzanine, a square inner courtyard and several tinajones. Open as a museum since 1973, it exhibits personal documents and possessions as well as furniture and objects belonging to the family and the colonial age. It is the square that used to be called Plaza de San Francisco. Completed between the 17th and 18th centuries, it was the final section of the royal road linking Puerto Príncipe with this part of the country. Its buildings date from various ages and have differing architectural styles: colonial baroque, neoclassical and eclectic. The Church of the Sagrado Corazón (Sacred Heart), with a neo-Gothic style, is the most impressive building in the surrounding area. According to historic evidence, it already existed in the 18th century with the name Plaza de Paula as it was close to the Chapel of San Francisco de Paula, demolished in 1906. 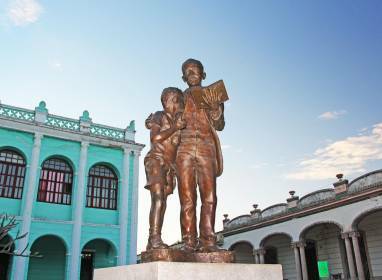 To honour the Lieutenant-General Antonio Maceo, known as the Bronze Titan due to his physical strength and bravery, it was officially called Plaza de Maceo in 1899 and a bust was erected in his honour in 1947. You can still see the tracks the tram used to travel on and the symmetrical paving stones of the streets dating from the beginning of the 20th century, which give the city a distinctive feel. This meeting place has witnessed major political, social and cultural events. The celebration of the key events for 26 July 1989 and 2007, led by Fidel and Raúl Castro, respectively; the processions of 1 May; the performances by well-known Cuban bands; and the Holy Mass celebrated by Pope John Paul II on 23 January 1998 are all events which have brought together thousands of Camagüey residents to the Plaza de la Revolución Square. The set of sculptures, designed by a multidisciplinary group in 1983, highlight the figure of Ignacio Agramonte surrounded by a monolithic piece in relief showing the most important moments in Cuban history. Considered to be Cuba's National Poet, the life and works of Nicolás Guillén represent a milestone in Cuban literature. His humble origins in Camagüey at the beginning of the 20th century left an important mark on his work. Personal items and family possessions can be seen in this beautiful house in which he was born, in the Historic Centre. Located at some distance from the city centre, it was mainly a settlement for the black population. All the residences have kept their original colonial style with doorsills separating them from the street. Life-size sculptures, made of clay, recreate the life and customs of the community and have made it internationally famous. 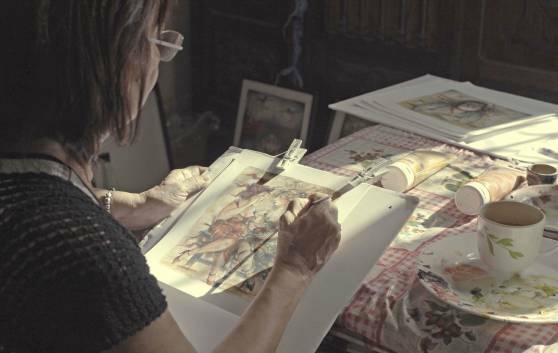 They are the work of the Camagüey artist Martha Jiménez, whose studio is in the same square. 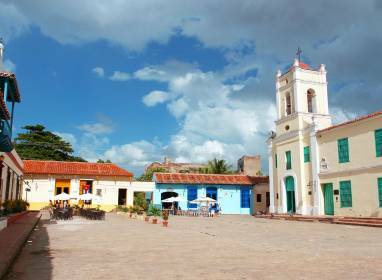 Next to the square is the Church of Carmen (Our Lady of Mount Carmel), Camagüey’s architectural treasure and an example of sober baroque architecture. Its two symmetrical towers distinguish it from other religious constructions. Important cultural events take place in the square, such as the San Juan festivities, which are the most popular in the city. 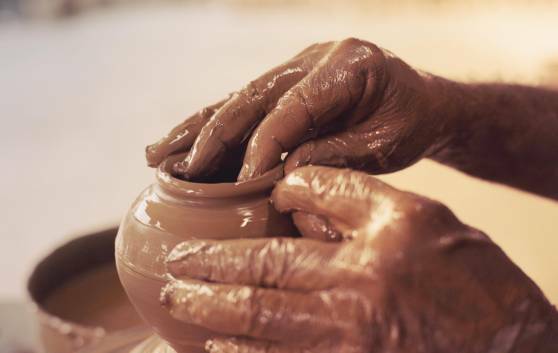 The Casanova Pottery Workshop keeps the clay tradition alive in Camagüey. In a city where its red roofs and tinajones are an icon, the potter’s art has been passed down from generation to generation. The Casanova family is a clear example of a life dedicated to this craft, which represents far more than creating clay piece. Travellers can visit the workshop and make their own tinajón while talking to the Casanova family about the tradition and importance of clay in Camagüey. 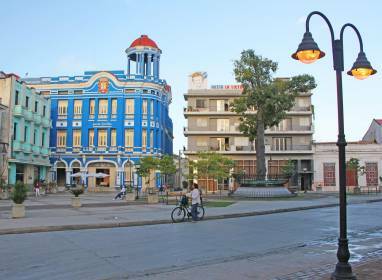 The entrance to Colón Hotel, immersed in the rhythm of daily life in Camagüey, invites guests to venture onto the most famous avenue in the city: Calle República. 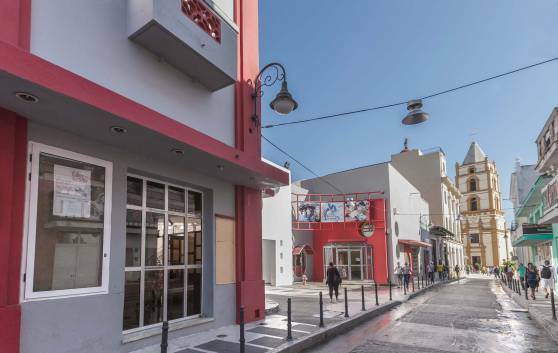 Currently used as a pedestrian avenue, the street is like a boulevard with art galleries, small shopping and cultural centres, restaurants, bars and cafés. Visitors can rub shoulders with the locals while wandering around the historic centre or simply stop to chat or read while sipping a cocktail or a delicious coffee in one of the lovely inner courtyards in the city. 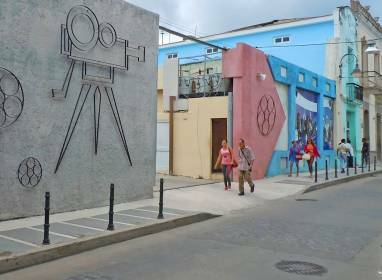 Alleyway dedicated to film on Calle Ignacio Agramonte, which pays tribute to the seventh art in a city proud of its rich cultural life. 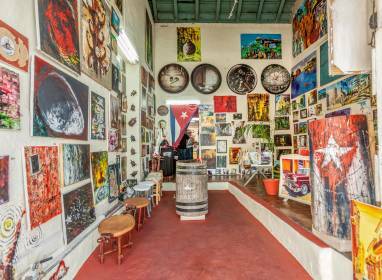 Exhibition spaces, cultural centres, bars, restaurants and shops invite you to experience the old town in the company of classic scenes and characters from the history of Cuban and international cinema. 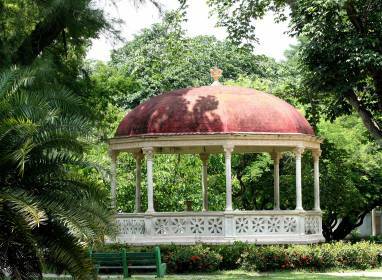 One of the most frequented parks in the city, Ignacio Agramonte, is a popular meeting place enjoyed by locals and visitors alike. 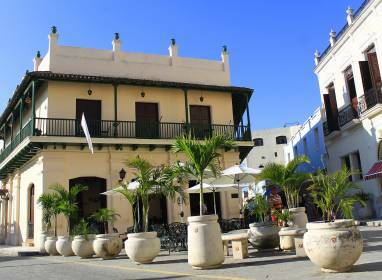 Surrounded by popular cafés, the busy Casa de la Trova where troubadour music is played, and very close to the hotels in the historic centre, this is a perfect place to take in the pace of everyday life in Camagüey. Other important cultural institutions are found in the area, such as the Julio Antonio Mella Library, the Old Town Interpretation Centre and the Major Parish Church. 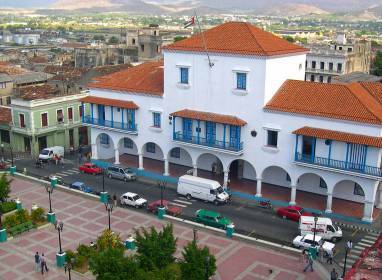 The small square of San Juan de Dios is one of the oldest in the city and it is still as beautiful and charming as it ever was. Typical colonial houses and churches shape the esplanade, surrounded by narrow alleyways full of small hotels, bars and art galleries. 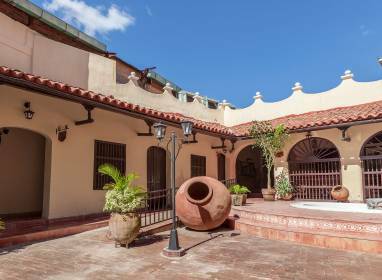 In the La Campana de Toledo restaurant you can admire the beauty of the typical Cuban inner courtyards, which in Camagüey also have the large, enigmatic tinajones for storing water. Some of the main attractions of this beautiful square are the small galleries run by local artists. 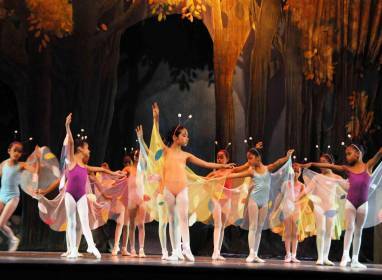 An art exhibition mixed with the authentic traditions of Camagüey. Scenes of the city and original pieces of naive art can be appreciated in these places that are normally also used as studios where you can speak with the artists themselves. 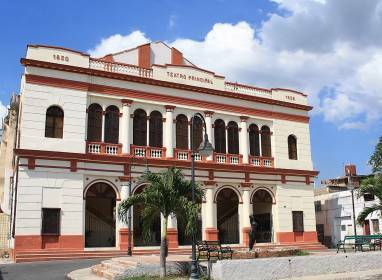 An emblematic theatre of Cuba, Principal de Camagüey is the prestigious home of the Camagüey Ballet of national and international fame. Its stage has hosted important music, theatre and dance events. 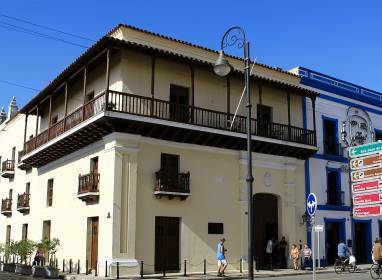 The Ejo Project, one of the most important for visual arts in Camagüey, operates in the venue popularly known as La Casona (Padre Valencia 65, on the corner of San Ramón and Lugareño). During the day you can talk directly with the artists and other members involved in this community initiative. Second most important ballet company in the country. 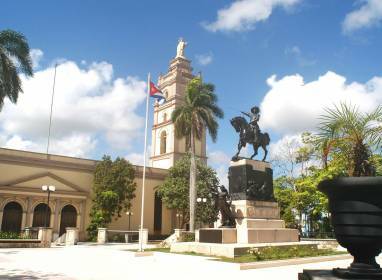 This is the largest city park in Cuba and one of the favourite leisure spaces of families in Camagüey. Just a short distance from the historic centre, it provides an ideal opportunity to escape from the hustle and bustle and to immerse yourself in the serene environment of the Camagüey countryside. 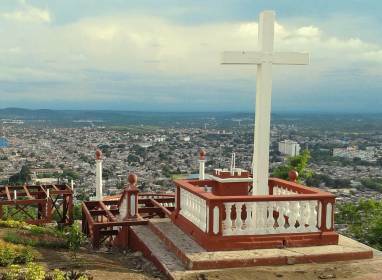 The Pearl of Southern Cuba, a heritage city surrounded by a charming natural landscape. 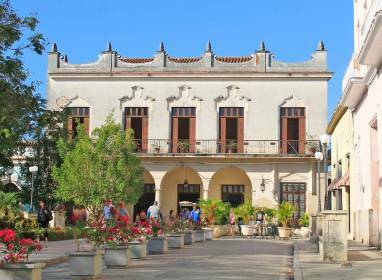 The Historic Centre of the city of Camagüey was declared a National Monument in 1980 due to the value of the urban layout, architecture, environment and history of one of the first seven towns to be established in Cuba. It is one of the largest in the country and boasts valuable exponents of the colonial era, for which it was also declared a UNESCO World Heritage Site in 2008. 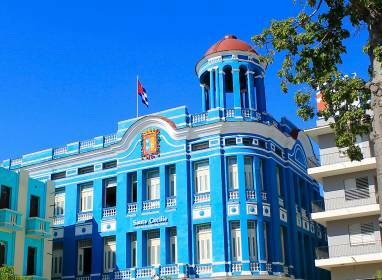 Beautiful city in eastern Cuba with a wealth of cultural traditions. You'll find this ecological reserve in the Sierra de Cubitas mountains, almost an hour away from the capital city. An important refuge for wildlife and plants, it is considered the largest and best preserved of the two woodland areas in the territory. One of the most significant natural features in the reserve is the Hoyo de Bonet sinkhole. There are other valuable heritage sites, such as the pictographs in Pichardo Cave, the best preserved in the Caribbean, and the deepest underground lake system in Cuba. 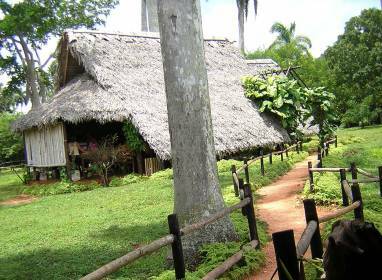 The Rancho King tourist farm, just half an hour from Santa Lucía Beach, is an ideal opportunity to make the most of the wonders of the Cuban countryside. Lovers of rural environments, specifically fans of rodeo and horse riding, will think this is a perfect place to have fun. You can appreciate the horsemen’s skills or demonstrate your own by taking up the reins. You can also visit a typical country house and see our local customs up close. The seaside resort of Santa Lucía Beach is 110 km from the capital city. A place blessed by nature, it stretches 22 km from Ganado Point to Los Cocos Beach. This beach is a great favourite because of its long strip of sand and the feeling of privacy it affords. 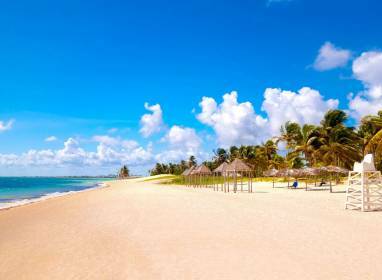 Caressed by the Atlantic Ocean, the typical colour of its waters and the closeness of one of the largest coral reef formations in the world set it apart from other beaches on the northern Cuban coast. 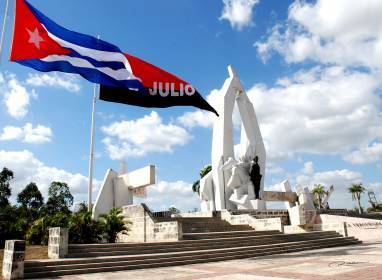 Known as the Hero City, Santiago de Cuba has amassed a long history of struggles for the country's independence. 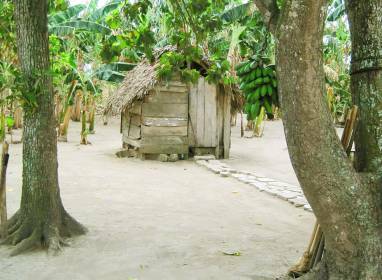 Its prime position around a small bay, whose waters flow between the Caribbean Sea and the Sierra Maestra mountains, turned it into a place where the West Indies and the American continent converge. Its streets and its people are living testimony to centuries of a mix of cultures that have shaped what is undoubtedly the most Caribbean city of Cuba. 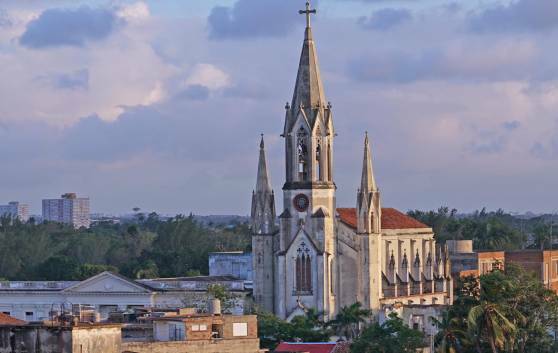 Declared a World Cultural Heritage Site, the city is famed for amassing over five centuries of architecture and the ancestral traditions of African slaves brought to the region, or stemming from Haiti and other islands. The music styles known as trova santiaguera, son and tumba francesa are some of the most important legacies of this tradition. The city hosts the Caribbean Festival and the famous carnival, two celebrations that attract thousands of visitors from all over the world every year. Another of its prized symbols is the rum culture, as some of the most important factories associated with emblematic brands, such as Havana Club, Santiago, Caney and Matusalén, are found here. Nestled at the foot of the largest mountain range in the country, the city provides easy access to a wide variety of incredibly stunning coastal and mountainous landscapes, especially Gran Piedra (Big Rock), the Baconao National Park or Turquino peak, the highest in Cuba. The Camagüey nights, calm and serene, also invite you to enjoy firsthand the joys of a city famous for its cultural and artistic wealth. In the boulevard of calle República or by the Ignacio Agramonte park, visitors can enjoy some amazing musical performances, both in bars and nightclubs such as the popular Casa de la Trova. In its parks and squares, the locals like to gather to chat and discuss life in general, whilst in Calle de los Cines there are some exciting examples of the seventh art. 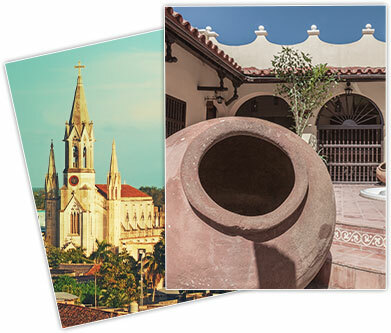 Download our guide to find out more about the hidden corners, history and legends of Camaguey.